This weeks builder gives the people what they want, epic scale buildings with meticulous detail and a side order of architectural history. Detroit’s own Jim Garrett has an ego inversely proportional to the size of his skyscrapers and a quiet approach that deserves your worthy attention. I met Jim next to the Spirit of Detroit statue outside the Coleman A. Young Municipal Center in Detroit Michigan. We talked about The pitfalls of urban exploration, The Temptations Vs. The Four Tops and Disco Demolition night at Tiger Stadium. We also talked about LEGO. KG: Talk about the challenges and epicness that is your Penobscot Building, the one you couldn’t assemble all at once inside your domicile. Is that the limit of manageable size, or do you plan to push it further? JG: While the Penobscot is my tallest model, it is not the largest. 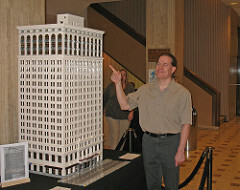 The Penobscot Building model’s main difficulty was figuring out how to pack all of those setbacks on the upper floors and still stick with the near-minifig scale of the model. Detail was not too much of a problem since architect Wirt C. Rowland was expressing a certain modernist simplicity. The model is designed in 12 sections which, when I transport it to a train show, almost entirely fill a Jeep Cherokee including its front passenger seat. It weighs about 165 pounds and provides a small workout to set up especially since it is now usually displayed as part of my model of the entire Penobscot Block. The block has four other buildings ranging from 1 to 6 feet high that bring the total weight to about 400 pounds and requires a full size Ford Econoline van to transport. Since many people outside of Detroit are probably not familiar with the Penobscot Building, I will simply mention that this 47 story structure was the 5th tallest office building in the world in 1928 and its design may have partially influenced the shape of the Empire State Building which was built in 1931. Google it if you have to. If I was younger, I would probably move on to a 17 foot high model of the Chrysler Building (it would have looked good in Detroit) in the same scale. As it is I will have to be content with the my upcoming model of the Guardian Building (“only” 8 feet high). 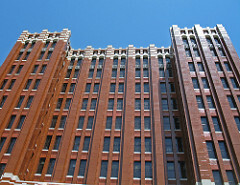 KG: Talk about your love of Detroit’s architecture that goes beyond the brick. What brought you out of your dark-age, and did you already have a list of buildings in mind before you started accumulating bricks? JG: My interest in architecture ironically had little to do with the ending of my LEGO dark-age. What got me back into LEGO was Peter Jackson’s LOTR and in particular Alan Lee’s design of Orthanc. After seeing “The Two Towers”, I dragged out what was left of the LEGO bricks from my childhood and tried to build a LEGO model of Orthanc. While I thought I had a large LEGO collection as a kid, it really wasn’t when you try to build a 4.5 foot high tower completely in black. I found myself purchasing new LEGO for the first time in many years. I recently replaced this, my first AFOL creation, with a more accurate 8 foot high version. After the original Orthanc model was completed, only then did I turn my thoughts to what to do next. That is when my love for architecture kicked in and I soon decided to build Detroit. I was not able to travel much when I was younger and so the only large city that I was really familiar with was Detroit. There is something about those old Art Deco towers reaching skyward that captured my imagination. New York has all that and to a much greater degree of course but it is not “my” city. KG: What are the biggest challenges to building on a scale that is usually reserved for theme parks. Do you employ any glue or non-LEGO support elements? JG: Money and organization. My construction techniques are usually pretty straightforward; I use SNOT and other methods but only when traditional brick construction will not suffice. None of my buildings use glue or non-LEGO parts; paired technic beams with 2×8 or 2×16 plates above and below make pretty strong structural elements. One lesson I learned early was not to employ used LEGO bricks, since they create a “weakest link in the chain”; my first version of the Fisher Building collapsed in ruin when I tried to move it because of a few 30 year old bricks. KG: Talk for a moment about your experience with MICHLTC. How did you come to find the group, what is its focus, and how does it differ from a LUG? JG: After I posted my first version of my LEGO Fisher Building model on Mocpages.com, Chris Leach of MichLUG left a comment and said I should join the club; it was as simple as that. I have enjoyed participating in MichLUG, there are a lot of friendly and talented people; for example Spencer Rezkella has practically created a building standard for small scale 1:650 skyscraper models that many other builders around the world are using. MichLTC is a subset of MichLUG but it seems to be about 90% of the focus. The club did display castle and space at local ComicCons and the like but those evens seemed to decline whereas the train shows increased. KG: You’ve got quite a few shows under your belt in a variety of sizes and locations. Which event has been your favorite, and why? What drives you to keep going through the challenge of moving your behemoths? 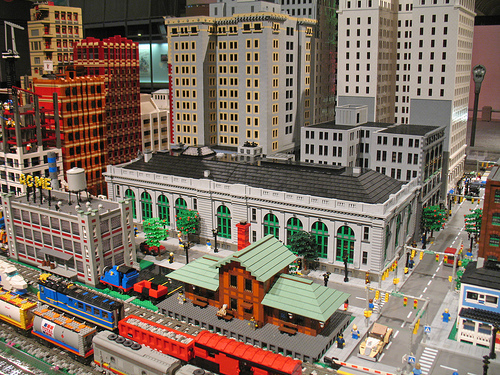 JG: A: Just as my favorite SF convention Chicon V was the first large event of that type that I attended, the same is true for the first really large train show in which I displayed some of my LEGO buildings. The NMRA National Train Show in Cincinnati was the most exciting. 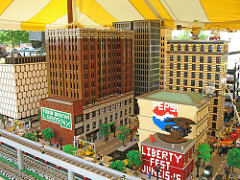 It was the first time I met many of the builders from other LUGs and we all put together perhaps the largest minifig scale layout up to that time (50 x 70 feet). There is even a 30 minute video of it on UTube. KG: Like many builders, you’re not very involved in the online aspect of the hobby. Can you define that side of the hobby for you and what do you make of the online fan presence in general? JG: I find both MOCpages and Flickr to be a great way to share LEGO creations and to discuss LEGO online; however, there seem to be a relatively few people into architecture for its own sake with respect to the entire LEGO community. Perhaps there are areas of the online LEGO community of which I am not aware. 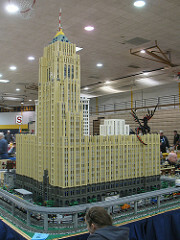 When I finished by first large model (the Fisher Building), I posted it on MOCpages and LUGnet. I got a reasonably positive response on MOCpages but on LUGnet a got very little; after I posted a few of my later building MOCs on LUGnet, I decided it was not worth the effort; the final straw was when someone posted a small Nazi flying saucer MOC on LUGnet and it got 50 times more discussion than my David Stott Building. Yes, much of that discussion was because of the controversial nature of the creation; but … 50 times?!? While I feel passionate about Detroit’s art deco and beaux-arts architecture, I can understand that for many this is not the most exciting topic compared to others such as … BATMAN! There is a large number of people creating MOCs related to Sci-Fi, fantasy, military, and superheros. While I enjoy seeing people post about those topics, I have made a choice to specialize which leaves me out of meaningful contributions to some of these other fields. I am content to post on MOCpages and Flickr and find others who are interested in architecture. Of course I do enjoy seeing and commenting on other people’s creations such as those for Lord of the Rings. I also never seem to have enough time to build, interact online, and also pursue my other interests. Another factor that limits my online interaction is that my day job is computer related and I enjoy the analog aspect of actually building with LEGO. KG: Is there any chance we’ll see you embrace (and therefore save) the “post apocalyptic” genre and tackle the less pristine monuments of Detroit’s skyline? If you were to embrace the beauty of decay, which crumbling urban monument appeals to you the most? JG: There is no chance. If I am on any mission at all with my building models it is to promote Detroit’s amazing collection of pre-depression architecture. Many consider it to be third best after New York and Chicago. After Detroit was beset by numerous problems and fell into decline, the media seemed determined to portray the city in the worst possible light; I will not contribute to that. Nevertheless there is something grand and sad about the Michigan Central Station as well as the old Packard Automobile plant. The currently empty 38 story Book Tower is also a building I would like to build but it is not ruined, it is just dirty. If I were to build any of those structures I would build them in their heyday, not with zombies pouring out of busted open doorways. KG: From the perspective of somebody who builds on such a massive scale, name 3 parts or innovations that would make your life easier or inspire you to greater heights. JG: LEGO light bricks. I know that they have made a few light bricks in the past but I would like to see a system that is reasonably priced and can be used to light buildings, street lamps, etc. Some more unusual roof parts such as the 33 degree 3×3 inside corner slope. Nothing. Part of the fun is to make a corinthian column capital out of various parts, not just snap in a one piece molded corinthian capital part that I ordered on bricklink. KG: Gaze into your crystal ball and tell us what Detroit will look like in 10 years, and what buildings you’re likely to produce during that same span. JG: Detroit’s downtown and midtown areas are improving and will continue to improve but I doubt that the skyline will look much different. The last major skyscraper in the city was completed 20 years ago. 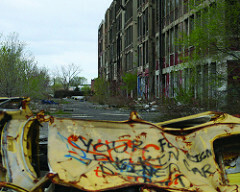 Detroit has to solve its budget and crime issues before it can make a full recovery; that will take time. My model of Detroit’s most exuberant Art Deco edifice, the Guardian Building, will probably take up much of 2013. After that I am not sure, I will need to get a bigger house first! KG: If you had to select just one of your models for enshrinement in the great FOL Time-Capsule, which would it be and why? JG: I supposed it would have to be the Fisher Building model since it based on my favorite structure in Detroit. JG: Jonathan Lopes. He has a lot of building talent and he is modest; I like that combination. Chris Leach. We could build Detroit’s RenCen and then I could get him to store that space consuming behemoth at his house! JG: Bill Gates or Steve Wozniak. There seem to be a fair number of programmers and other computer related professionals into the LEGO hobby. I am sure either of these two would have done great things with ABS if they weren’t destined for more important achievements. Depending on which operating system “religion” you follow, you could wish that the other founder had spend ALL of their time as an AFOL instead of inflicting their operating system on our computers. Thanks for posting this. As a native Detroiter, I’m familiar with Jim’s work, but it was nice to learn more about it. Keith, are you from Michigan as well? Thanks Eric, I think Jim gave one of the best interviews of the series and he was a pleasure to work with. I am not from Michigan, I currently reside in the wasteland better known as Las Vegas. Oh, how very sad for you. ;-) Living in Vegas must be rough! What brought you out to Detroit? Truly enjoyed this interview. Great job. Well, I’ve grown accustomed to the city, its not so bad in winter. I have only been to Detroit as a teenager in, 1984 to watch the horrible tigers destroy my beloved San Diego Padres in the World Series. I conduct all the interviews by email and make up most of the introduction paragraph from whole cloth and a little help from google. Jim is one heck of a builder.when he joined the club it helped push me into making more Detroit buildings and make them more detailed and realistic. For the past 4 years Jim and several other members of MichLUG have been displaying at The Henry Ford muesum around Christmas and Jims buidings are allways a HUGE hit among the visitors. I think our goal is to make as many Detroit buildings as possible and perhaps by the 20th anniversary of MichLUG(2020) we will have most of the large buildings done. lol Gotcha! I’ll have to remember that little trick.